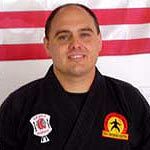 Sensei Miller began martial arts with Judo and wrestling in high school. Later studied Tae Kwon Do, Hapki-Do and Shaolin Kempo before joining Martial Way in 2000. Cross-trained in Modern Arnis (Filippino stick fighting). Police officer for 20 years, 8 of those in New York City. Certified instructor, police non-lethal use-of-force, defensive tactics, straight/expandable baton, O.C. (pepper spray) and ground fighting. US army paratrooper for four years. Combines a traditional martial arts background with unorthodox methods, practical experience, and a sense of humor to teach informative and entertaining classes for all ages and levels.